External auditory canal (EAC) atresia (EACA) is a rare congenital disorder. Accurate counseling and referral for these children and their families demands an appreciation of the range of management options and indications for intervention. This article reviews the history, etiology, and epidemiology of EACA, as well as the clinical care of children with this condition. EACA was first described in Western medicine by Paulus of Aegina in the seventh century AD. Paulus recommended simple incision for opening the atresia. Later, physicians used a hot iron probe to maintain canal patency after incising the atresia. The first operation to correct an atresia of the EAC was performed in 1882 by Kiesselbach. Unfortunately, the operation left the child with a facial nerve paralysis. In 1914, Page reported on a series of eight patients who underwent operation. Of these eight patients, five had a subjective improvement in their hearing after surgery. In the early 20th century, techniques for correction of the atretic external canal have involved opening the antrum and aditus of the ear and lining the cavities with a skin graft. In these surgeries, the atretic bony plate was untouched, and the resulting hearing improvement was poor. In the past 50 years, improved radiologic and audiologic assessments coupled with improvements in surgical technology, such as the operating microscope and facial nerve monitoring, have resulted in good surgical success rates for properly chosen patients with EACA. The future of medical and surgical interventions for patients with EACA is exciting and includes such novel approaches as computer-aided surgery as well as critical reviews of past surgical results, with further attempts to increase success rates and minimize morbidity. The EAC is composed of medial bony and lateral cartilaginous portions. The bony component changes from half of the length of the tubular EAC in children to two thirds of the length of the tubular EAC in adults. The lateral soft tissue portion of the EAC begins to form at 26-28 weeks' gestation, when the epithelial plug arising from the first branchial cleft begins to canalize. During the sixth month of development, the medial bony portion is created out of the temporal bone's mesenchymal condensation. As canalization occurs, the mastoid separates from the mandible and grows posteriorly and inferiorly. The facial nerve travels along with the posteroinferior growth of the mastoid, taking its final course from the middle ear and mastoid and exiting the skull base inferior to the EAC. Congential atresia of the EAC is caused by a failure of canalization of the epithelial plug portion of the first branchial cleft. Persistence of the tympanic ring results in a bony atresia plate at the level of the tympanic membrane. Ossicular malformations may be seen as they arise from the first branchial cartilage (ie, Meckel cartilage). Failure of the EAC to canalize means that sound cannot reach the tympanic membrane; thus, a conductive hearing loss results (see the images below). Concomitant ossicular malformations may result in additional conductive hearing loss. In addition, 11-47% of patients also have a sensorineural hearing loss in the affected ear. Audiogram of a 5-year-old girl with right unilateral external auditory canal atresia (EACA) is shown. 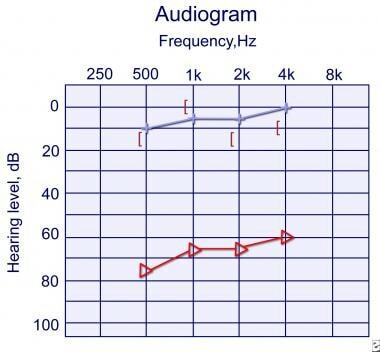 The audiogram demonstrates a right conductive hearing loss seen by the difference in hearing levels between the red triangles and the black brackets. The left ear hearing levels shown by the blue line are normal. This child demonstrated good function at home and in preschool and did not require intervention at this point. Audiogram 1 year later of the same child as in the image above. Her functioning in kindergarten continues to be excellent, and she has noticed hearing improvement at home. 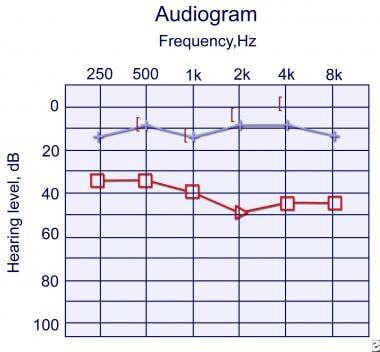 Her physical examination shows a pinpoint opening at the external auditory canal (EAC) now, and this audiogram confirms improved hearing in the right ear compared to the prior audiogram (see image above). Her right conductive hearing loss is shown by the distance between the black brackets and the red triangles. EACA may be seen with microtia (ie, maldevelopment of the external ear). The auricle develops from ectodermal condensations and mesodermal condensations (referred to as the hillocks of His) at 5 weeks' gestation. Case reports have detailed duplication anomalies of the first branchial cleft occurring in conjunction with a congenital aural atresia. It is therefore important for the evaluating physician to keep in mind that EACA and duplication anomalies can be present in the same patient and that both may have to be simultaneously addressed (surgically). The precise etiology of the failure of EAC canalization is not known. Associations have been postulated between EACA and low birth weight, intrauterine trauma, toxins, or infection. Genetic defects are being identified for several craniofacial anomalies. Because of the importance of future genetic studies, serum must be obtained and banked for eventual genetic testing. According to Jahrsdoerfer, the incidence of ear malformations in New York City from 1952-1962 was 1 in 5800 births. In one year of this study, the incidence of EACA was 1 in 8000 births. EACA is rare in persons with a normal pinna. The incidence of EACA with concurrent microtia is 1 in 10,000-20,000 live births. Unilateral EACA is 3-6 times more likely to occur than bilateral atresia. The right ear is more often involved than the left ear. Family histories positive for EACA are noted in 14% of patients. EACA occurs with a normal pinna or with an abnormal pinna (ie, concomitant microtia). When the atresia occurs in the setting of a normal pinna, the average age of diagnosis is 2.5 years. However, when EACA occurs with abnormal development of the pinna, the average age of diagnosis is 3.5 years. EACA occurs more often in males than in females. Hearing is measured in dB; normal hearing is considered to be between 0 and 15-20 dB for children. Higher measurements indicate sounds must be louder for a person to perceive them. A jet plane, for example, has a sound pressure level (SPL) of approximately 110 dB. Children with ear infections usually have a 40-dB hearing level. The House Ear Institute published its results in 2004. It compared modifications in its technique with its previous surgical technique. The new modifications included the use of the Argon laser, thinner split-thickness skin grafts, Silastic sheets, and Merocel wicks in the external auditory canal. With these modifications, hearing results were closure of the air-bone gap to 30 dB or less in 63% of patients, with a long-term postoperative air-bone gap of 30 dB or less in 50% of patients. Ossicular chain refixation occurred in only 4% of these patients. For unilateral conductive hearing loss due to unilateral EACA, Glasscock et al explain to patients that if surgery is successful, they should be able to listen to stereo music, tell the directionality of sound, and hear better in a noisy environment. In a quiet place or in one-to-one conversation, patients are told not to expect improved hearing after surgery. An excellent study that included a cost analysis of the surgery versus hearing aids found that "even with significant investments in EAC reconstruction, most patients still required some form of amplification." [8, 9] Cost analysis suggests that osteointegrated bone-conduction devices may have an economic advantage over surgical intervention. Jahrsdoerfer RA. Congenital atresia of the ear. Laryngoscope. 1978 Sep. 88 (9 Pt 3 Suppl 13):1-48. [Medline]. Lambert PR. Major congenital ear malformations: surgical management and results. Ann Otol Rhinol Laryngol. 1988 Nov-Dec. 97(6 Pt 1):641-9. [Medline]. De la Cruz A, Linthicum FH Jr, Luxford WM. Congenital atresia of the external auditory canal. Laryngoscope. 1985 Apr. 95(4):421-7. [Medline]. Jahrsdoerfer RA, Yeakley JW, Aguilar EA, et al. Grading system for the selection of patients with congenital aural atresia. Am J Otol. 1992 Jan. 13(1):6-12. [Medline]. Teufert KB, De la Cruz A. Advances in congenital aural atresia surgery: effects on outcome. Otolaryngol Head Neck Surg. 2004. 131(3):263-70. [Medline]. Levi JR, Grundfast KM. Congenital malformations of the ear. Wetmore RF, Muntz HR, McGill TJ, eds. Pediatric Otolaryngology: Principles and Practice Pathways. 2nd ed. New York: Thieme; 2012. Chap 13. Glasscock ME 3rd, Schwaber MK, Nissen AJ, Jackson CG. Management of congenital ear malformations. Ann Otol Rhinol Laryngol. 1983 Sep-Oct. 92(5 Pt 1):504-9. [Medline]. Evans AK, Kazahaya K. Canal atresia: "surgery or implantable hearing devices? The expert's question is revisited". Int J Pediatr Otorhinolaryngol. 2007 Mar. 71(3):367-74. [Medline]. Yellon RF. Congenital external auditory canal stenosis and partial atretic plate. Int J Pediatr Otorhinolaryngol. 2009 Nov. 73(11):1545-9. [Medline]. Caughey RJ, Jahrsdoerfer RA, Kesser BW. Congenital cholesteatoma in a case of congenital aural atresia. Otol Neurotol. 2006 Oct. 27(7):934-6. [Medline]. Fu Y, Li C, Dai P, Zhang T. Three-dimensional assessment of the temporal bone and mandible deformations in patients with congenital aural atresia. Int J Pediatr Otorhinolaryngol. 2017 Oct. 101:164-166. [Medline]. Sheykholeslami K, Sheykholesami K, Megerian CA, Kaga K. Vestibular-evoked myogenic potentials in infancy and early childhood. Laryngoscope. 2005 Aug. 115(8):1440-4. [Medline]. Ishimoto S, Ito K, Karino S, Takegoshi H, Kaga K, Yamasoba T. Hearing levels in patients with microtia: correlation with temporal bone malformation. Laryngoscope. 2007 Mar. 117(3):461-5. [Medline]. Vrabec JT, Lin JW. Inner ear anomalies in congenital aural atresia. Otol Neurotol. 2010 Dec. 31(9):1421-6. [Medline]. Fan X, Wang Y, Wang P, Fan Y, Chen Y, Zhu Y, et al. Aesthetic and hearing rehabilitation in patients with bilateral microtia-atresia. Int J Pediatr Otorhinolaryngol. 2017 Oct. 101:150-157. [Medline]. Sheykholeslami K, Mohammad HK, Sebastien S, Kaga K. Binaural interaction of bone-conducted auditory brainstem responses in children with congenital atresia of the external auditory canal. Int J Pediatr Otorhinolaryngol. 2003. 67(10):1083-90. [Medline]. Seo YJ, Kwak C, Kim S, Park YA, Park KH, Han W. Update on Bone-Conduction Auditory Brainstem Responses: A Review. J Audiol Otol. 2018 Feb 26. [Medline]. [Full Text]. Yu JF, Chen YS, Cheng WD. Gain affected by the interior shape of the ear canal. Otolaryngol Head Neck Surg. 2011 Jun. 144(6):945-9. [Medline]. Mazita A, Fazlina WH, Abdullah A, Goh BS, Saim L. Hearing rehabilitation in congenital canal atresia. Singapore Med J. 2009 Nov. 50(11):1072-6. [Medline]. Marfatia H, Priya R, Sathe NU, Mishra S. Challenges During Baha Surgery: Our Experience. Indian J Otolaryngol Head Neck Surg. 2016 Sep. 68 (3):317-21. [Medline]. [Full Text]. Rosa F, Silva A, Reis C, Coutinho M, Oliveira J, Almeida E Sousa C. Bone Anchored Hearing Aid (BAHA) in children: Experience of a tertiary referral centre in Portugal. Acta Otorrinolaringol Esp. 2017 May - Jun. 68 (3):151-156. [Medline]. Ricci G, Volpe AD, Faralli M, Longari F, Lancione C, Varricchio AM, et al. Bone-anchored hearing aids (Baha) in congenital aural atresia: personal experience. Int J Pediatr Otorhinolaryngol. 2011 Mar. 75(3):342-6. [Medline]. Farnoosh S, Mitsinikos FT, Maceri D, Don DM. Bone-Anchored Hearing Aid vs. Reconstruction of the External Auditory Canal in Children and Adolescents with Congenital Aural Atresia: A Comparison Study of Outcomes. Front Pediatr. 2014. 2:5. [Medline]. Hol MK, Cremers CW, Coppens-Schellekens W, Snik AF. The BAHA Softband. A new treatment for young children with bilateral congenital aural atresia. Int J Pediatr Otorhinolaryngol. 2005 Jul. 69(7):973-80. [Medline]. Siegert R, Mattheis S, Kasic J. Fully implantable hearing aids in patients with congenital auricular atresia. Laryngoscope. 2007 Feb. 117(2):336-40. [Medline]. Lee JM, Jung J, Moon IS, Kim SH, Choi JY. Benefits of active middle ear implants in mixed hearing loss: Stapes versus round window. Laryngoscope. 2017 Jun. 127 (6):1435-1441. [Medline]. Colletti L, Carner M, Mandala M, Veronese S, Colletti V. The floating mass transducer for external auditory canal and middle ear malformations. Otol Neurotol. 2011 Jan. 32(1):108-15. [Medline]. Oliver ER, Lambert PR, Rumboldt Z, Lee FS, Agarwal A. Middle ear dimensions in congenital aural atresia and hearing outcomes after atresiaplasty. Otol Neurotol. 2010 Aug. 31(6):946-53. [Medline]. Battelino S, Hocevar-Boltezar I, Zargi M. Intraoperative use of mitomycin C in fibrous atresia of the external auditory canal. Ear Nose Throat J. 2005 Dec. 84(12):776-9. [Medline]. Yamane H, Sunami K, Takayama M, Tochino R, Konishi K, Iguchi H, et al. Application of modified transmastoid approach methods to congenital atresia of the external ear canal with middle ear infection. Acta Otolaryngol Suppl. 2004 Oct. 38-44. [Medline]. Park C, Yoo YS, Park HJ, Park YS. An analysis of the bacterial flora found in the external auditory canals of microtia patients: results and clinical applications. Ann Plast Surg. 2010 Aug. 65(2):197-200. [Medline]. Satar B, Yetiser S, Ozkaptan Y. Acoustic characteristics of reconstructed ear canal after atresia surgery. Br J Audiol. 2000. 34(6):379-81. [Medline]. Photograph of the right ear in a patient with unilateral external auditory canal atresia is shown. Note the relatively normal pinna and thumb print concha. CT scan in the axial plane of right unilateral external auditory canal atresia (EACA) is shown. The right external auditory canal (EAC), to the left of this photo, is not developed compared to the normally developed left EAC. The image is slightly tilted in the horizontal plane. CT scan showing unilateral auditory canal atresia in coronal section of the right ear. No ear canal is seen to the left of this picture (patient's right).